Why are the Olmec important? The earliest state government in North or South America was the Olmec. They formed their state about 1200 BC. 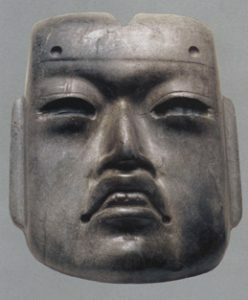 Were the Olmecs the first state? This is about the time of the Mycenaean kingdoms in Greece, or the Third Intermediate Period in Egypt, or the Assyrians in West Asia. So the Olmec aren’t the first state in the world, but they were somewhere in the middle. Where did the Olmec live? 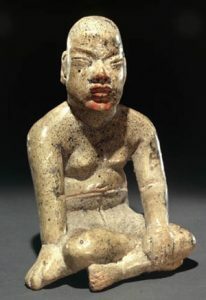 The Olmec (OHL-meck) lived between North America and South America, in Central America (what is now the southern part of Mexico). This was good land for farming, with a big river bringing plenty of water. People began to farm corn and beans there about 2000 BC. Probably once people began to farm they had more kids. So there got to be a lot more people living in Central America than there had been before. As they got more crowded, they formed into villages, and then into towns, and then into cities. Soon some people emerged as their leaders, and they had formed a state. What else was happening about this time? The Olmec rulers built groups of big stone temples at Tenochtitlan and in several other places nearby. People used these temples to worship the Olmec gods. But they also used them (like earlier Norte Chico temples) to store food and generally as government buildings. The Olmec used writing to record their thoughts on slabs of stone (like our gravestones). Did the Olmec trade with other people? Get your own Olmec head! The Olmec traded with other people all over South America. Traders carried Olmec pottery all over Central America and Mexico. They brought back pottery to Olmec cities from other people who lived nearby. Probably the Olmecs also traded tar, or bitumen – sticky black oily stuff like asphalt that you can use to patch boats and seal up roofs. Some of the trade was probably on boats that travelled up and down the rivers. Some trade was overland, carried by traders walking from city to city. Around 900 BC, after three hundred years, the Olmec pretty much abandoned their main city at Tenochtitlan and moved their government to another city. We call this new city La Venta. Maybe this was because of changes in the weather at this time. Or it may have been because the river changed its course and the people moved to be near the new riverbed. Some people think it could have been because of a civil war or invasions. How did the Olmec lose power? The Olmec state kept on ruling Central America for another five hundred years after this move, but by 400 BC the Olmec seem to have lost control of this area. Nobody knows how this happened, or why. As they lost control, new leaders like the Maya and the Zapotec gradually took over. Did you find out what you wanted to know about Olmec history? Let us know in the comments! Cite this page: Carr, K.E. Who were the Olmec? Central American history. Quatr.us Study Guides, September 9, 2017. Web. April 21, 2019. There is absolutely no information about the important features of the Olmec in this article. What were you looking for, Sarah? What should I include?